Much has been said about how the Brexit would be a huge game changer for the global economy and monetary policy. This week, we’ll get our first glimpse on how major central banks are reacting to this with the Reserve Bank of Australia’s interest rate decision. Unlike some monetary authorities who were quick on their feet, RBA policymakers have refrained from making any drastic announcements right after the EU referendum results were made official so their upcoming policy statement would likely make a huge impact on the markets. After all, the Brexit is expected to have spillover effects on global trade activity, possibly putting a dent on Australia’s raw material and commodity exports. However, the consensus view is that the RBA would sit on its hands for now, keeping rates on hold at 1.75% but probably shifting to a more cautious stance. A quick look at the latest batch of figures from Australia shows that the economy ain’t doing so bad, as trade and inflation numbers are showing green shoots. Then again, consumer spending has been subdued and housing market demand has been slowing, which might then weigh on growth prospects. Speaking of the housing market… The fact that building approvals and new home sales have eased could mean that fears of a property bubble are fading, potentially giving the RBA room to lower rates further without worrying about stoking housing inflation. This means that the Australian central bank could be in a better position to ease if necessary, although they might not pull on this string just yet. Keep in mind that the RBA just cut interest rates back in May, citing a weaker inflation outlook. At that time, the central bank downgraded its target inflation range from 2-3% to 1-2% following weaker than expected quarterly CPI data in Q1. RBA Governor Stevens added that subdued labor costs could keep a lid on overall price levels for the time being, although the latest jobs data indicated a bit of upward pressure on wages. 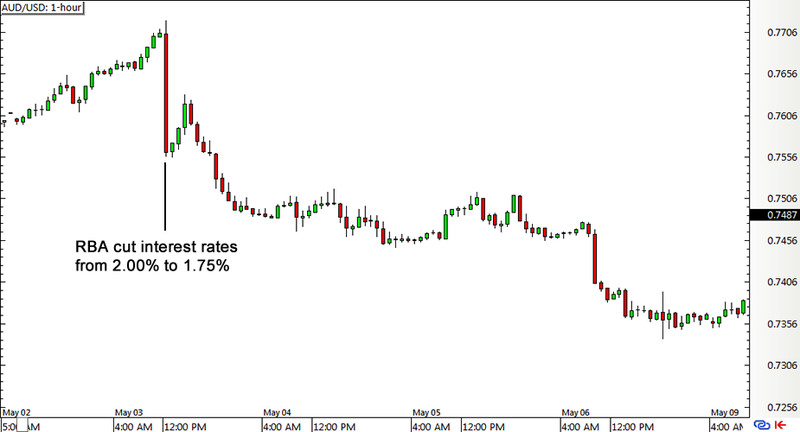 Still, since the May RBA rate cut was mostly seen as a surprise, AUD/USD made a sharp 150-pip drop right after the announcement, followed by a continuous decline for the rest of that week. Meanwhile, the June RBA decision triggered a bullish reaction from the pair when the central bank refrained from cutting, but most of these gains were returned later on. Another factor to keep in mind when watching or trading the upcoming RBA statement is the federal elections in Australia. Analysts predict that monetary policy changes will be put on hold after the elections to give way for the new government to make fiscal adjustments first, but the vote-counting over the weekend might leave the country with a hung parliament or a coalition government. In other words, the Land Down Under is also dealing with a bit of political uncertainty on its own so the RBA might not be keen on making more waves at this point. 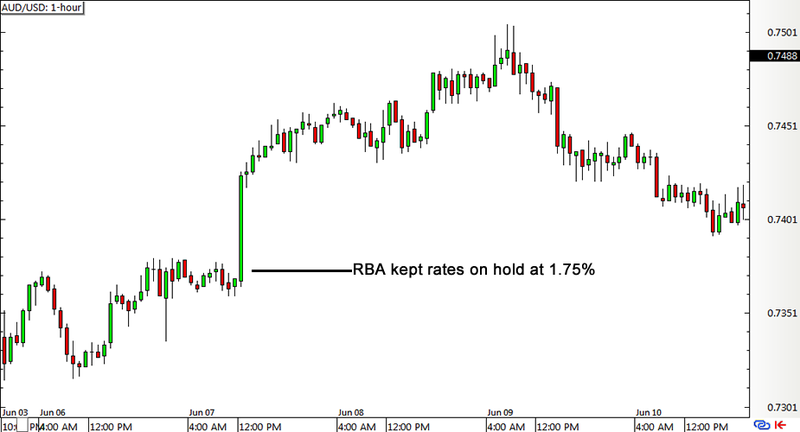 Are you planning on trading the RBA decision? Share your game plan in our comments section or cast your votes in our poll below!